We just finished putting together our sales rep presentation, which means that for several weeks, I've been "knit cramming" to finish all the new designs for springs. And for the first time in my 30+ years of knitting, my left arm is killing me! I was advised to go on a regiment of ibuprofen (400mg x 3 times/day) which I more or less did. And now that the cramming is over, I am "trying" to cut down on my knitting, at least for a few days, to get my arm to stop hurting. Easier said then done. The idea of not knitting, even for a few days, quite frankly, stresses me out. And that's a bit disturbing. It feels like trying to kick a bad habit. But knitting is a good thing!! So last night, my arm was feeling better...soooo, I did a little of knitting...just a little. And here it is. This is the start of a small shawl. The main section will be picked up on the upper edge and worked in short rows to give it a shallow, semi-circular shape. The color is called amber (hard to see in this back lighting) and the yarn is Cozette, a new yarn we are introducing for spring, a super-soft to the touch blend of silk and cotton (will be in stores mid-December). Can I hear a "yummmmmy?" 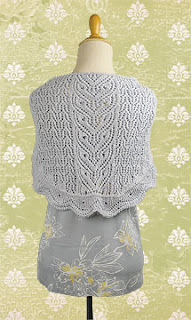 I am designing this shawl for Creative Knitting magazine. 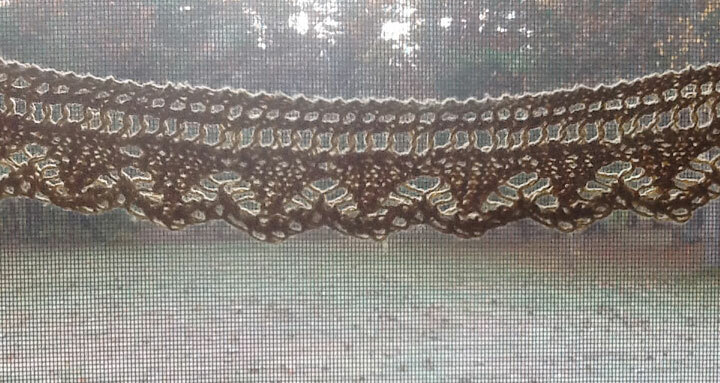 Here's another shawl with the same shape that is part of our spring collection, also working with Cozette. 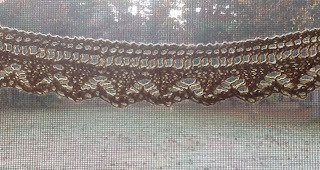 I call this one "Lace Owls Shawl" because the center lace pattern looks like owl faces. This pattern will be in the April 2013 issue of Knit'n Style magazine, and will also be available as a single pattern through retailers and on our website next week. Maybe you need to DRINK more! Seriously, knitting for too long will do me in. Crocheting not that way, besides I can do it in my sleep! But I'll agree that a time machine, one that would take us back to all pre conditions, sure would be nice!